When the Saudi prince bought the Salvator Mundi in 2017, people were not shocked at all about the $450 million price tag. In fact, everyone was kind of expecting it. Christie’s hyped the sale so much that year that people were already expecting a record-breaking sale. The Salvador Mundi is now the most expensive piece of art sold and the most expensive one Saudi Arabia bought. But not everyone seems fine with the idea that art should be sold with such a price tag. There are artists out there who disapprove of how the global art community are treating this news. A good example right now is Adrian Wilson, who in his latest work, The Supreme Mundi, criticizes the Salvator Mundi sale. To understand the critique of Adrian Wilson through the Supreme Mundi, people must understand what the Supreme Mundi is: It is a skateboard. It is a toy similar to scooters, the kind that only has a handlebar attached to a board with wheels and propelled by the rider by kicking or pushing the ground. The difference between a skateboard and a scooter is that it has no handlebars. A skateboard is a board with wheels that a rider propels by pushing the ground with their feet. Why Wilson chose this shape is part of another story that he feels is related to the Salvator Mundi sale, at least in spirit. It is that of the sale of the 248 Supreme skateboard decks for $800,000 to a 17-yr old young man from Vancouver, Canada. 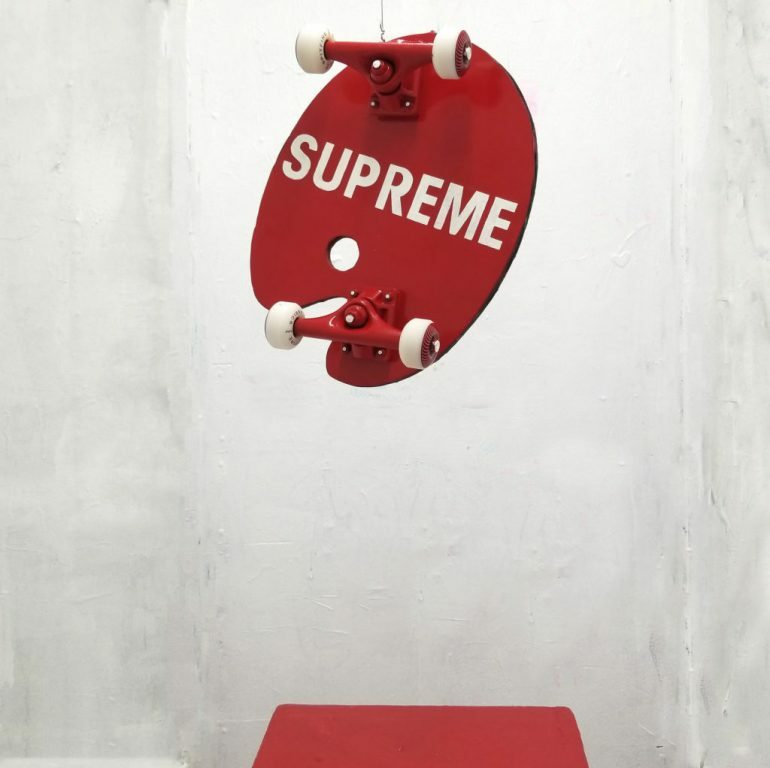 The details goes like this: Carson Guo, an Asian living in Canada, has bought the Supreme skateboard decks from Sotheby for $800,000. He’s an avid collector of Supreme skateboard decks and plans to exhibit the boards in the skateboarding store he’s planning to open in Vancouver. He’s also just 17 years old. Wilson thought that the Salvator Mundi sale is essentially just like the Supreme skateboard sale. That’s why he slapped the name “Supreme” on a skateboard. 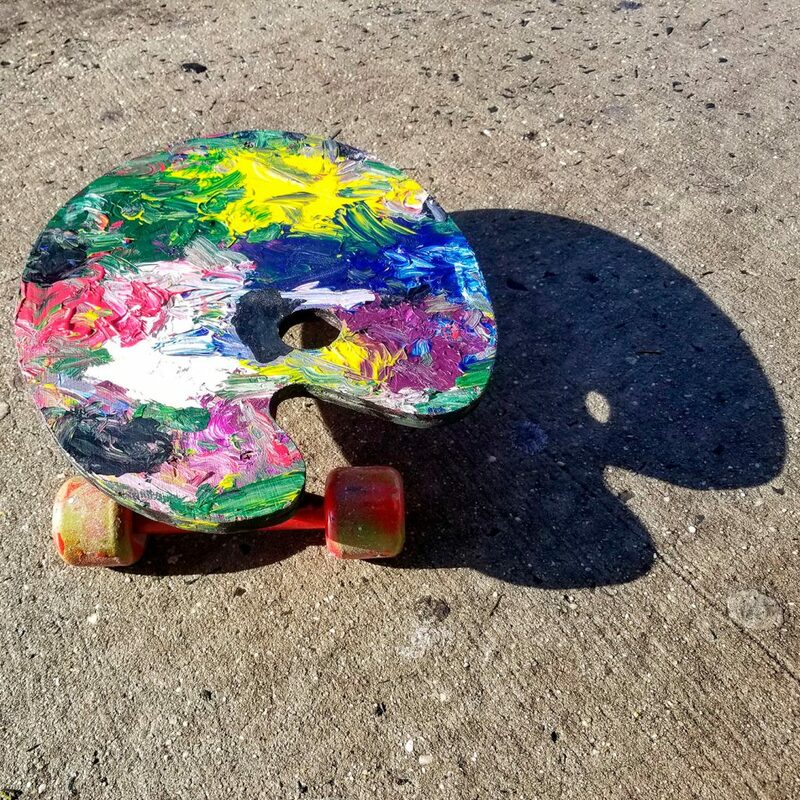 For added kicks, the skateboard was in the shape of a painter’s palette, and Wilson asked the audience to imagine that the palette was also the same palette used to restore the Salvator Mundi. It is kind of obvious where Wilson is going with this: The Salvator Mundi is essentially just a painting. And the Supreme skateboards are essentially just skateboards. He likely feels that there is no reason at all for the painting to have that much amount of price on it, as that there should be no reason a bunch of painted-on skateboards should cost for around $3,200 each. Much more when the Salvator Mundi is going to be displayed in a place that not many people are willing to visit: Saudi Arabia isn’t exactly a tourist spot. Just like how skateboards are meant to be stepped on. It is much more important to value an artwork based on its history, rather than the points one gain in society by purchasing it. Although he likely said as much, he’s not really going to escape the ridiculousness of how people value things differently. The Supreme Mundi was sold for $20,000, making it the most expensive skateboard in the world. And it isn’t just a pristine, unused skateboard either: Wilson said that the skateboard “is fully functional,” meaning he tested it by riding it like any other skateboard. “This isn’t just a usable novelty skateboard,” he said. “This is a commentary on the 500-year artistic and financial hypebubble we are in right now.” He also noted that Guo represents a new breed of art collectors, one that hypes the prices up all for social media points and has no interest in the history behind it. While Wilson is right that the Salvator Mundi sale was more likely for the social media points, because Saudi Arabia is undergoing a progressive and liberal change right now, he most likely made a mistake using Guo as an example. Collectors of niche things like Guo are likely interested in the history behind their coveted prizes. And while there are a lot of points that Saudi can win with the Salvator Mundi, skateboards are a niche interest after all. Much more so than paintings. 1st and 2nd Image: The Supreme Mundi. Via artnet.com.